This is a spectacular loadout for the venerable and often overlooked .41 Magnum Cartridge which, by all accounts is one of the most capable rounds in existence for large game pistol hunters all over the North American continent. 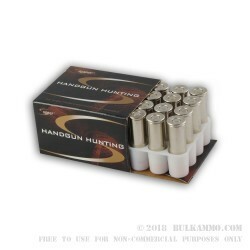 This round not only is loaded for that express purpose and done so at a very high level of performance, but will act as a perfect donor cartridge for those hand loaders who are interested in pushing the limits of the round but need top tier brass to do it. This brass is truly top tier as well, with the nickel-plated brass build and the Boxer primer, which makes it easy to reload and clean/prep for new loadouts. The long lasting, premium brass will easily work for several reloadings, thanks to the ballistic flexibility of the .41 Mag load. The .41 is so widely known by hand loaders as a perfect experimentation round that can easily outperform much bigger cartridges if loaded in certain ways. The wide range of game that can be taken and the similar performance in personal protection and home defense settings makes this a very undervalued round in terms of the relative potential of the caliber. 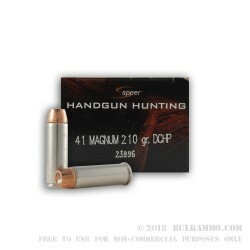 A 210 grain JHP projectile tops this premium casing with premium powder.